Lewisville, Texas Aug. 31 '69. Comments: Italian bootleg. Deluxe jewel case. The Train Kept A Rollin' is listed as Sweet Baby. Any copies of this for sale? Please let me know. I find this something of an odd CD. Although the show has been weirdly mixed with guitar and drums over to one side and vocals to the opposite, the fidelity is excellent. 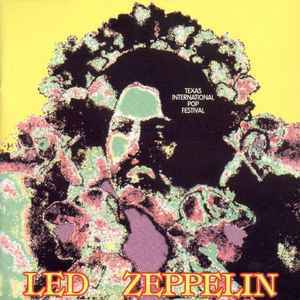 From the latter perspective this really is one of the better unofficial Led Zeppelin soundboards currently available. The problem I have is with the performance. After a bit of a ramshackle start the show basically becomes 50 minutes of Jimmy Page soloing, with little in the way of the riffing or explosive chord work common to Page's playing during this period. Granted, this does mean Page gets to showcase a hell of a lot of blistering fingerwork. However, spanning the course of almost an hour it eventually becomes a very one-dimensional listening experience, revealing that Page (unlike contemporaries such as Clapton or Hendrix), lacked the ability to sustain extreme levels of extended soloing without reaching the point of sounding boringly repetative. Unfortunately that negative aspect is strongly accentuated by virtue of Bonham and Jones being mixed more as a backing band than as integral elements of the sonic fabric. And Plant? With this performance he has a tendency to take advantage of the lack of group-focused jamming to exercise his spontaneous howling and wailing in a way some people may find excessive. All of the members of Led Zeppelin are on stage, but somehow the group magic is missing. This title often makes the upper ranges of Zeppelin bootleg top tens, but I can't help thinking that's often more down to the quality of the sound rather than the performance itself.